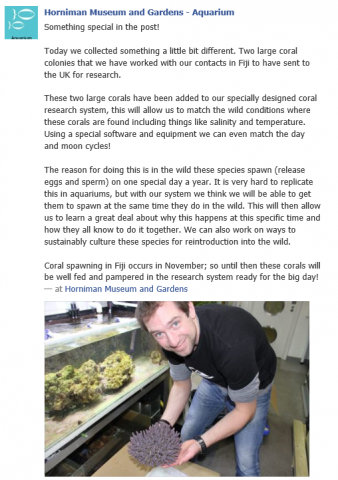 Horniman Coral Delivery – project now underway! So you may have read the abstract (here) I jointly presented with Jamie Craggs at the Horniman museum at the RCUK convention this year, well the project is now well underway with the first corals having arrived today! This entry was posted in Aquaria, Horniman Museum and tagged Aquaria, Horniman Museam.